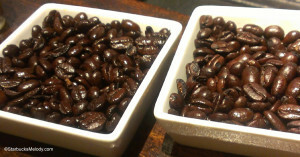 A Coffee Event Featuring Starbucks Espresso Roast. 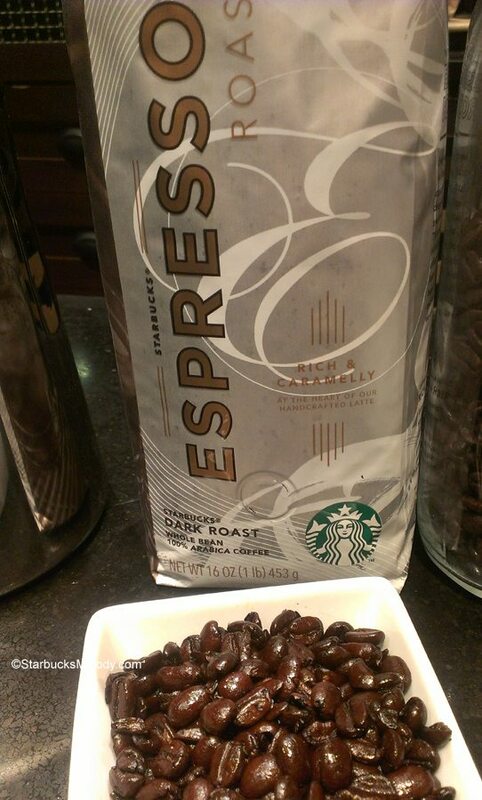 This past Monday (October 28, 2013), I went to a coffee seminar at the East Olive Way Starbucks. 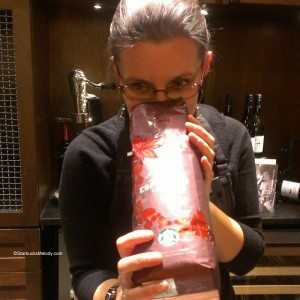 Coffee Master Jess featured Starbucks Espresso Roast, and we compared flavor via brew methods, and compared it to Starbucks Christmas Blend Espresso Roast. I’m sure everyone reading this knows this, but just because a coffee is roasted to a dark espresso roast profile, doesn’t mean that you cannot enjoy the same coffee via any brew method you like. I have seen the confusion where someone says that Starbucks Espresso Roast is “only” for pulling espresso shots. This is not true! You can use any coffee for your espresso. 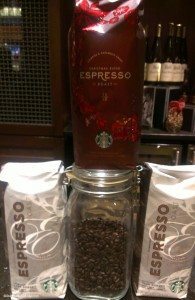 You can use your Starbucks Espresso Roast for any brew method that you like. I have a true fondness for Espresso Roast. 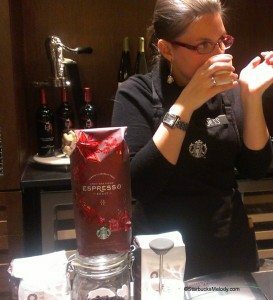 When Pike Place Roast was introduced into the Starbucks coffee lineup (in April 2008), Starbucks stores stopped brewing bold coffee all day. In 2008, this was before there were Clover Starbucks everywhere too. Actually, I recall some frustrating times when I felt like I was going to give up on Starbucks. When partners would say there was ‘no bold’ and they said that they could not open a one-pound bag of coffee, I would often ask for Espresso Roast to be made a drip. Unfortunately, this did annoy some partners who then would insist that I should order an Americano because it’s ‘the same thing.’ My only point is that the flavor of the coffee IS greatly affected by brew method. And this is true for every coffee, not just Espresso Roast. The body of the espresso shot definitely had that characteristic caramelly sweet flavor, which Espresso Roast is known for. This was great. I would not normally drink straight shots, but a doppio con panna with perfect shots is a thing of beauty for me. For me, the surprises came when comparing the paper filter-brewed (Bunn brewer) Espresso Roast with the Clover brewed Espresso Roast. The paper filter absorbs a lot of the oils of the coffee beans, and so it takes out some of the body of the coffee. It was a little thinner in the mouth than what I remembered. The aroma (with both brew methods) had a lot of the smokiness of the roast profile. I was surprised at how much better it was from the Clover than from the Bunn brewer. I say that with sincerity. I do not automatically that the Clover is the best brew method for every coffee. The Clover brewed Espresso Roast had more of the caramelly, burnt-sugar flavor, and a bigger mouth feel. The Clover won for me, hands down. The final brew method was via the French press. I haven’t had Espresso Roast on a French press in ages. This was quite a experience. The coffee was much oiler than any other brew method. (I have heard it said that some people who are on a very strict low-oil diet will only consume paper filter-brewed coffee to avoid oil consumption.) The tasting cup of coffee had almost a visible oil sheen to it. The aroma from the French pressed coffee was very smoky, and there was almost no acidity at all to it. This was a very smooth cup of coffee. 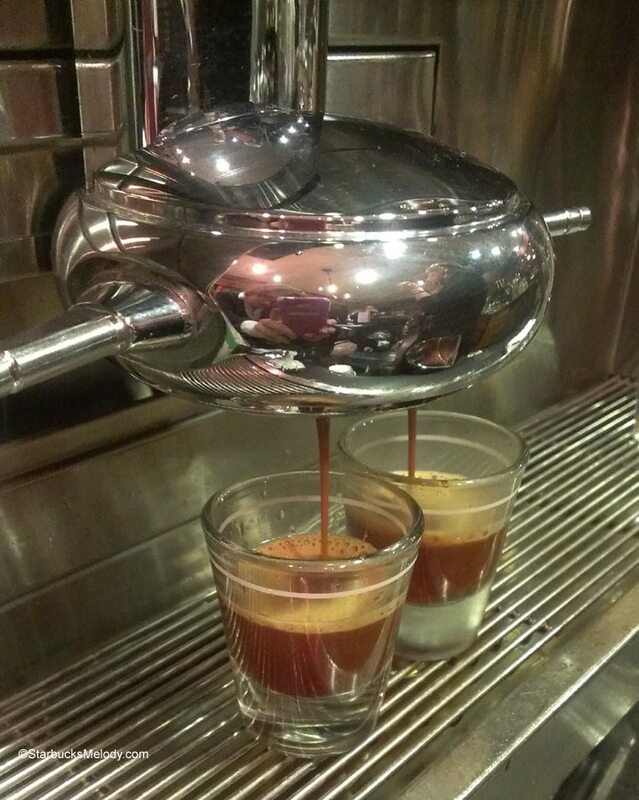 Clover brewed Espresso roast was the clear winner of each of the brew methods. And, I have ordered this at times, and loved it. Starbucks Espresso Roast was blended by Dave Olsen, a former Starbucks partner (now retired) who was with Starbucks for decades and decades. It is said that he used Starbucks beans, and blended the Espresso Roast for Cafe Allegro (an independent Seattle coffeehouse). Howard Schultz met Dave Olsen, immediately saw his coffee genius, and persuaded him to become a part of Starbucks. 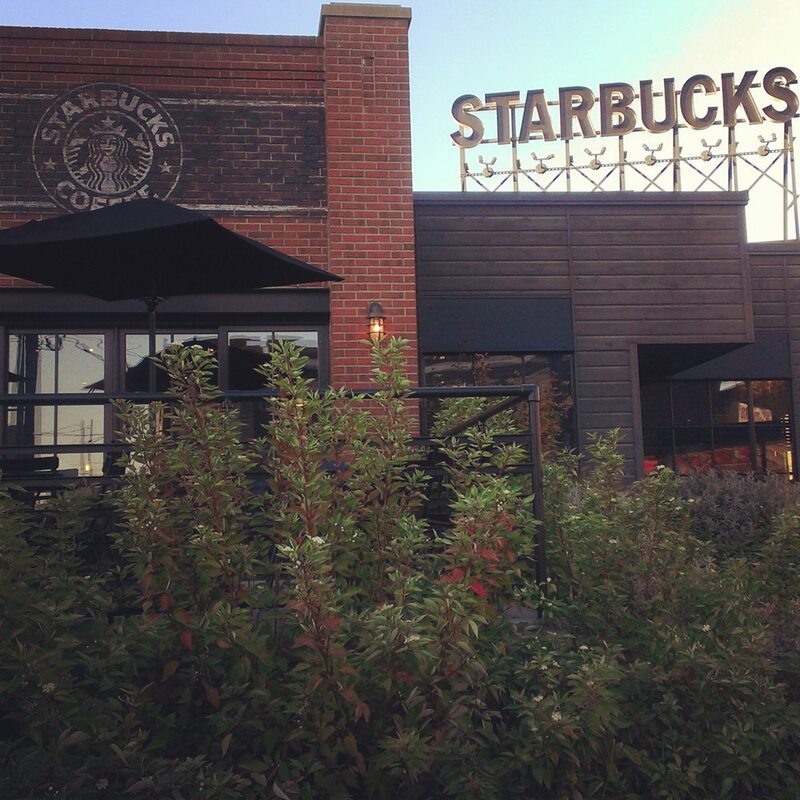 He was the highest level coffee executive at Starbucks, until he retired in 2013, when Craig Russell took his position. What was really amazing at this coffee event was that we ended with a sneak tasting of Christmas Blend Espresso Roast. 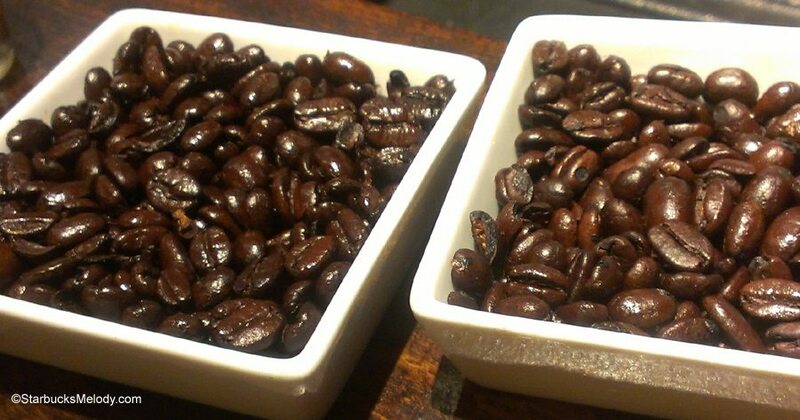 This is Starbucks Christmas Blend roasted to an espresso roast profile. Oh yes, and I loved this year’s Christmas Blend Espresso Roast. It will be amazing for home – just as your basic cup of coffee. Smooth. Bold. Complex. Spicy. Wonderful. Starbucks Christmas Blend and Christmas Blend Espresso Roast are available in stores on November 12, 2013. Starbucks Gets a New and Improved Gingerbread Latte! Holiday Beverages Starting 11-1-13. The Coffee Shandy: Fun with Willow Blend. This year’s Starbucks Casi Cielo: Try with strawberries. Finding the Hidden Messages in the Starbucks Whole Bean Coffee. New Starbucks Reserve: Ka’u Launches August 20th. Melody I always feel as if I am sitting at these events with you. It is such a shame that these tastings are not at all stores. I might have to save some for February. When we get our 10-year remodel, we’re getting a Clover!! I can’t wait. @Purple1 – I would like to see more of these kinds of events too. Even just more basic sampling would be good, but prepared well-put together coffee education seminars for the public at Starbucks could stand to be more common. I don’t really think *all* stores need it – some stores (especially for example the tiny Mon Fri stores at the bottom of tall office towers that have all office workers visiting them) don’t have the right customer base for it. But I would soundly vote for more stores to have these kinds of coffee seminar experiences. @Kristen – I’m glad I’m not alone in my love for the Christmas Blend Espresso Roast! Fantastic blog about the loveliness of espresso roast…makes me really wish we had a clover in my store, but I’ll go for the affogato doppio con panna with light caramel drizz any day! 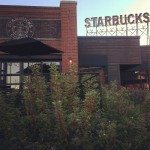 😉 I agree with the statements above…store/public coffee tastings are exciting events to attend and host! What a great way to really give our partners the opportunity to go beyond the bag and really get to know our coffees and share that knowledge and passion with our customers…it also gives us a relaxed moment after to sit and chat with each other furthering our connections…the growth of coffee knowledge and sales in our store has expanded way more than we originally had anticipated when we started up a coffee tasting program…a true testiment of the importance of developing partners in this area…thank you for inspiring others to bring these events to their stores by sharing your experiences…your amazing, miss Melody! I always enjoy the nice big meaty articles. It’s cool to see all the coffee knowledge found in an other location that others can easily access. It makes for some great inspirational reading. @Erin & Mark – Thank you for the great comments. I love that there are others who geek out over a good coffee event too. As much as I enjoy coffee, I’ve never been to a true tasting where background information about the coffee bean is shared. Would be a wonderful experience I’m sure. I usually do not purchase Espresso Roast for at home brewing, but I did recently and look forward to trying it out after I finish up my bag of Caffe Verona. One thing I found most interesting with this post is how there’s a distinct difference in the taste and depth of flavor depending on how the coffee is brewed. Currently, I use the pour over method with paper filters and never really thought about how they absorb a lot of the oils from the coffee beans, reducing its body. Hmm, maybe I need to give French presses a try. Good post! I agree with you Melody, the Christmas Espresso is wonderful, and it IS an amazing coffee for at home. Im a partner up in Canada, so we have had almost a week to enjoy all the Christmas Blend coffees. 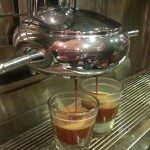 I found this article so interesting…I feel like the Espresso roast is one that often gets forgotten about in stores because its used for pulling shots for beverages. I am feeling some inspiration to do a tasting for the partners in my store in the near future, so thank you!! !